When you’re self-employed, there are times when keeping a positive mindset can feel like a tall order. You may be feeling overwhelmed by how much you have to do or having a major wobble about a large gap in your diary with no bookings. You may have had a client relationship breakdown or are struggling to get paid for training you’ve delivered. Whatever the reason, it’s inevitable that most of us have down days, especially after a setback in our businesses. Although every situation offers an opportunity to learn and set processes in motion to stop the same situation occurring again, you may need time to regroup before that can happen. The question is how can we turn these down days on their head and create a more forward-thinking positive mindset instead of focusing on what’s been and gone? Meditation is proven to have a vast number of benefits. By just taking a couple of minutes out of your day to relax and meditate, you can improve your mindfulness, connect with your feelings and what you need to feel better, improve your intuition and concentration span, decrease feelings of anxiety, boost your metabolism and much more. Try keeping a gratitude diary or a gratitude jar and write down one positive experience or thing you’re grateful about to go in it every day. One study found that when a group of students spent 20 minutes a day writing about a positive experience for three consecutive days, they continued to experience benefits three months later, when compared to a control group who wrote about neutral experiences. Writing down positive things can therefore help mould your brain and body to be more positive. Whether you go for a run, practice yoga, leave the office for a 10-minute walk, or put some music on loud and dance yourself into a positive mindset, movement is shown to have huge benefits. It can boost the mood enhancing chemicals in your brain, such as endorphins, and decrease the chemicals that lower your mood. I always find a great way to list my mood is to set a series of achievable goals or to break down the big tasks on my to-do list into smaller, manageable chunks. It’s been proven that achieving goals is a great confidence booster and will help you focus on one task at a time rather than getting overwhelmed by the big picture. As a self-employed trainer, especially if you work alone, business can get lonely sometimes, even if you have some great client relationships. Sometimes the most helpful and productive thing you can do is arrange to meet a friend for a cuppa or speak to a mentor who understands the challenges of running your own business. 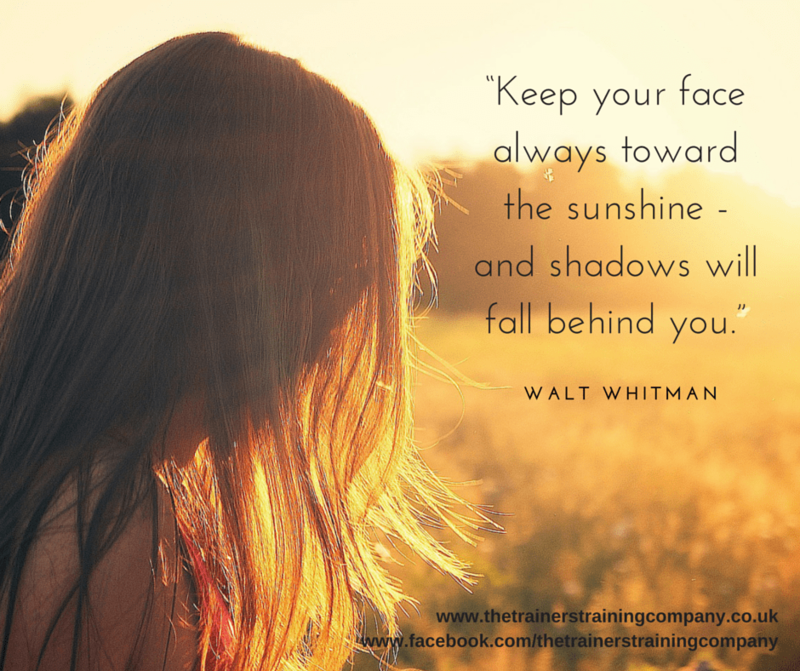 If you miss talking to other trainers, you could do some virtual networking and hang out in Facebook groups, on The Trainers Training Company Facebook page or find groups aimed at trainers on LinkedIn. Or you could take part in face-to-face events like Trainer Talk Live to listen to some inspirational speakers and collaborate with other trainers? What do you do to lift your mood when you’re having a rough day or week in your training business? 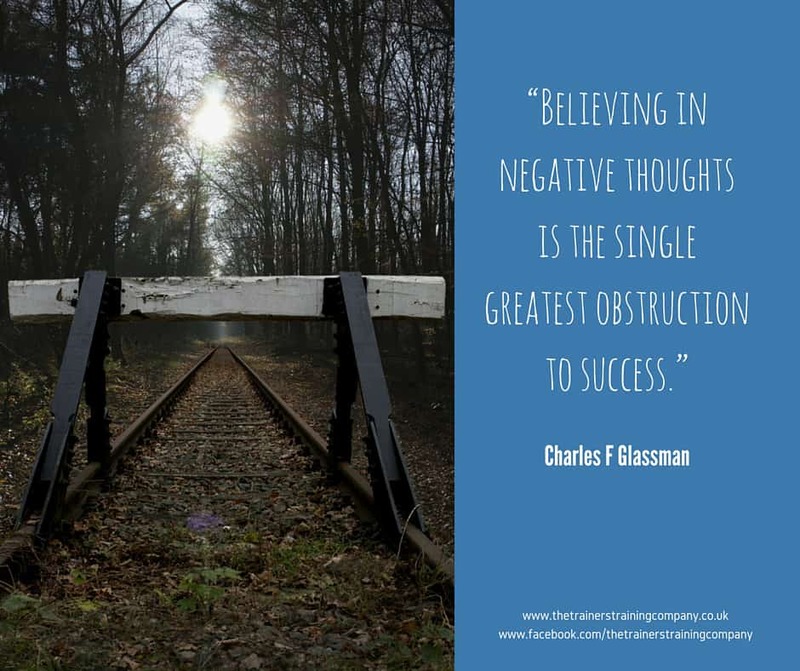 Do you believe it’s possible to think yourself into a positive mindset? What are your best mood boosters? I’d love to hear your thoughts in the Comments below. If you’re looking to connect with other trainers or get advice about running your training business, please do contact me about group mentoring, one-to-one mentoring or attending the next Trainer Talk Live event.